We often read and heard that many employers encounter all sort of problems and issues with their domestic helper or maid. For some families both husband and wife are working plus they have elderly and children at home, so they really need the maid to help them with their daily chores. It’s a gamble of luck, some families get good and caring maid but some had a disaster time. Yay or Nay to have a domestic helper or maid at home? Well, so far I am glad that I had someone who had been a great help at home. This round, thank God I got quite a decent maid. I have encountered problems with my ex-maid, it was disaster and I sent her back to avoid further chaos. Now basically I can relax, concentrate on my work and spend more quality time with my family instead of spending the weekend scrubbing the toilets or doing the laundry. She has been a great help at home, making sure the house is tidy and clean and also our meals are taken care of. We treated Anne as part of our family ever since she stayed with us for more than a year. Of course no one is perfect including myself, both party will have to tolerate with each other too. As an employer, I will ensure her basic necessities and salaries are taken care of. So at the end of every month, I have to send her salary back to her hometown in Philippines because her whole family is relying on her for their survival. Having an e-remit account since last month comes in very handy. I can help her to send money to her family more conveniently and faster through e-remit. Well, it’s a small gesture but makes a big impact to her and her family. Plus I can do the remittance anytime and anywhere. It offers an opportunity for me to give back to someone who has helped me so much at home throughout the years. And now e-remit is even better because it has partnered up with MoneyGram, a world leader in money transfer services. Now, users can remit money online to 200 countries and territories with MoneyGram via e-remit's portal. For more details and my past experience with e-remit you can read my previous blog post here. So this means that now you can also send money to your family, or your children studying overseas in places such as Australia, UK, USA, Japan and many more. 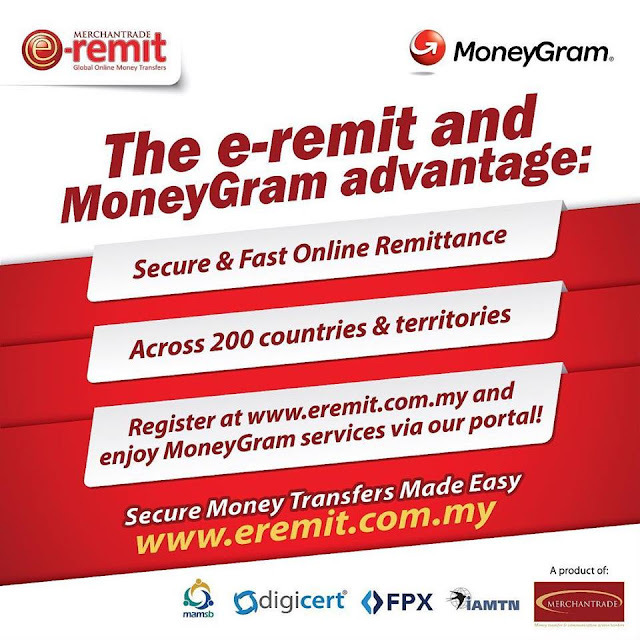 When logging in to the e-Remit site, you have the option to select remittance via MoneyGram or via e-Remit. For the e-Remit option, there are 9 countries that you can remit money to, namely Indonesia, the Philippines, India, Nepal, Pakistan, Myammar, Sri Lanka, Bangladesh and Singapore. When remitting money to these 9 countries, you will enjoy additional benefits such as competitive exchange rates, low services fees and no fee imposed on the recipient of the money. Oh means when Bangladesh working in malaysia they can use this app to send money to their families otherwise if we want to do charity to the families especially in Sri Lanka but I wonder how's the safety? Through PayPal or online banking ? So confusing hu3. . Sometimes I feel headache when i need to send money to Indonesia, you know "the exchange rates, services fee, etc". I should try this one. Good sharing. Maybe I should try this. Good info babe! This platform is definitely helpful in preventing scams and money lost through mail! It is good that you found a nice and hood helper at home. Now everything is just a click away. So convenient and easy. This sounds like a good platform. Great tools to remit money to our helper. She happy we happy too! Looks like a fab platform. It's my first time hearing about it so will definitely check it out further. Thanks for sharing. Btw, your helper is lucky to have such a sweet, thoughtful and caring person like you by her side. I think it is a wonderful option for people working here too to send back money to their home country. I heard of e-Remit somewhere else. Thanks for sharing again. It is really convenient to have e-Remit. hmm..i wanna try using this la. sometimes need it when i book oversea hotel, i need to transfer money. Glad that you found a great helper and this service for remittance. I will share about it with my helper too. The helper will find it easy using e-remit as it faster and safer provided the owner help them to send. My maid will be very happy knowing the new way to send her money home. Safer for her now. This website is so convenient to use and give many advantage for those who need to send money overseas! Thanks for the write up ya. My step father from Indonesia, and he always need to go bank to transfer the money for his family. This website is so convenient and I should tell my father about this. Thanks for sharing.